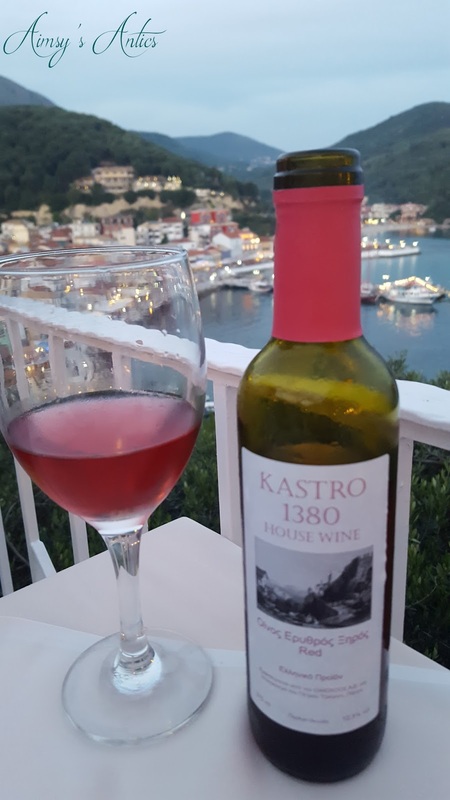 I visited Parga in Greece for the first time at the beginning of this month…and I fell in love. Above you can see a video I made with a mix of video and pictures from the trip. It is the first ‘vlog’ I have made, and I hope you like it. It is quite long, as we fit so much into a one week trip! Below I will add a few pictures from the trip, and try to give a breakdown of which beaches we visited, what trips/excursion we did, and some of the food/drink we enjoyed. Parga is situated in the Northwestern region of Preveza in Epirus. Located in a bay of the Ionian Sea, it definitely brings an island feel to this mainland town. From land, you are greeted with a beautiful view of the harbour/port with a green islet on which a white church stands. From the sea, you get a beautiful view of the multi-coloured buildings that are constructed up the mountain slopes. It is breathtaking! Along the harbour are a tonne of cafes, bars and tavernas, all with the beautiful view of the sea. The real treat is when you walk around the winding streets, filled with more cafes, bars and tavernas, as well as a shopaholic’s heaven of shops. Shops selling everything from the usual tourist picks, to leather goods, and jewellery. There are also a plethora of art type shops, which are a must to see! Greek food is my favourite, so I am always happy with whatever I eat when I visit this beautiful country. I may have mentioned in a past post that my favourite dish is Gemista (stuffed peppers/tomatoes), however, I only had this dish once whilst in Parga. In fact, we struggled to eat out most evenings as we had filled up so much during lunch! My friend who I went on the trip with is vegetarian and we had no problem finding food for her to eat. There was even a vegetarian version of the ever popular Greek fast food, Gyros. During lunch we often opted for meze type meals, meaning we chose several appetisers from the menu to share. My friend’s favourite dish to order was the lovely tzatziki (yoghurt, cucumber and garlic type dip), with mine being fried courgette or zucchini. On the nights where we did not eat an evening meal, we usually went to one of the back streets from the harbour to sample the various flavours of ice-cream available. My favourite choice being pistachio flavour. At the time of the trip, I had not planned to blog about it, only make a vlog, and therefore I wasn’t always the best at taking photographs of the food and drink we were enjoying. As well as good food, there was also lots of lovely places to have a drink. Many of the cafe bars along the harbour had happy hours, usually spanning a few hours between 5 pm to 8 pm. Cocktails are always a must on trips away, and Parga didn’t disappoint with them. We usually had a drink along the waterfront so that we could watch the world go by and the trip boats coming back into port. This often meant that we didn’t really venture to the back street bars or even the ones overlooking the waterfront from the streets above (This is definitely on my list to do next time I visit). During happy hour cocktails were approximately €6, going up to €8-9 outside of the happy hour times. We also sampled great Greek wine and found a really nice cheap wine in the supermarkets. This came in a plastic oil bottle and was about €2, which for the price and type of bottle we were pleasantly surprised with how nice the wine actually was. A trip to Greece would also not be complete without sampling the local Ouzo! As far as I know, there was only one place that made their own ouzo, and this was called The Parga Distillery, which can be found in the ‘old town’ of Parga. Ouzo or wine was often offered when waiting for a table at a busy taverna, which of course I always accepted. My friend was not as fond of the ouzo as I, and she was offered a nice orange type liqueur. Frappes were also a favourite of mine to drink whilst soaking up the sun on the beach. A frappe is the Greek version of an iced coffee, but with a twist to what you might find in the likes of Starbucks or Costas. The instant coffee of choice is usually Nescafe, which is mixed with a little bit of water, and then whizzed up with a milk frother type electric whisk. You can see the coffee foaming when it is being whisked. Once the foam reaches high enough in the glass then evaporated milk is usually added (if you like milk in your coffee), with more water, ice and sugar added if you desire. The coffee foam can have a bitter taste, but I don’t mind this as I usually do not take sugar with my coffee. Now my one of my favourite parts of visiting Greece is going to the beautiful beaches, and luckily there are quite a few in and around Parga. My friend and I are like-minded and both prefer to spend the day at the beach, swimming in the sea rather than in a swimming pool. We opted to buy our own sun parasol and laid on our beach towels rather than paying for the rented sunbeds available. We picked up a parasol for around €7.50 from one of the many supermarkets in Parga and carried this to each beach we visited. We visited four different beaches and visited other snorkelling spots during a boat trip. Parga Town itself has two beaches, the main one being Krioneri beach and the other being Piso Krioneri. Piso Krioneri beach is much smaller than the main beach and is mainly pebble than sand. There is a lovely taverna situated on this beach (see picture above – a selection of appetisers), and I would highly recommend visiting it if you are on this beach. Apparently, these two beaches get very busy as the summer season heightens, but we found that they were not overly busy when we visited. There is another beach closer to the town, just on the other side of the castle, called Valtos beach. Now, this beach can also get very busy, as it is long and sandy, offering watersports for those who would like a bit of an adrenaline rush. We decided not to go to this beach, as we preferred a bit more of a relaxed and quieter beach to spend the day, but we did pull into the beach when on the water taxi to another beach. We heard about another beach called Lichnos which you could either walk to, through olive groves or get a water taxi to. We thought that it would be nice to walk to the beach and get the water taxi back. Now let me tell you, the walk is not for the faint-hearted and it would be a bit troublesome for people with mobility problems. Parts of the walk are steep through the olive groves, and in the height of summer I can imagine not very shaded from the sun, but it is so worth the hike. The views looking back on Parga are beautiful, as is the view looking down on Lichnos beach. There is also a lovely little church along the way, and a small snack bar if you need a pitstop. We were advised to follow the red arrows along the route, and choose the camping side of the beach as this part has amenities such as toilets and a small supermarket. I am sure this is mainly for the people camping and not for general beachgoers, however, we were rulebreakers that day. The beach of Lichnos was beautiful, the beach fairly sandy and the water very clear. The part we chose was lovely and peaceful, as the sunbeds for hire were a bit further away from us. I am glad we chose to get the water taxi back, as I didn’t fancy making the trek back. We had been told that if we did walk back we might have a few tag along’s as the farmer sometimes releases his goats to have a wander around. The last full day of our trip we spent at my favourite beach out of all the beaches we visited, Sarakiniko Beach. We opted to pay for the €11 return water taxi, which took around 20 minutes to reach the beach. It is a smallish sandy beach with beautiful clear and turquoise waters, which took my breath away when were approaching, as well as when I sat looking out into the bay it is situated. Again we didn’t rent sunbeds, however, these are available. There were around two to three snack bars/restaurants available, which we only used for drinks as we bought our lunch from one of the bakeries in Parga. There was a taverna up quite a lot of stairs, overlooking the beach. I walked up so far to get a good view of the beach, which you will be able to see in the video at the start of this post. The beach was also good for doing a bit of snorkelling, as there are a few rocks sticking out from the sea further out, and I was lucky enough to spot my second starfish of the trip! I know in future visits, I will be visiting this beach regularly. Two days out of the seven we occupied our time with a few trip/excursions. Together we rented a boat with a skipper for the day, from about 11 a.m to about 4 p.m for €140, with Parga Boat Rental. This was a fab day out, as our skipper, Achilleas, knew the area well, and was able to show us some of the better spots for snorkelling. He also snorkelled with us and showed us what to look out for such as octopus and fish. Nearer lunchtime, he drove the boat part way up the Acheron river, in a village called Ammoudia, which can be accessed from the sea (more on this river later). Achilleas invited us to have lunch in one of the local tavernas in Ammoudia, which had lovely food, and plenty of local Greek people eating there. We finished off the day with more snorkelling on our way back into Parga, where we saw our first starfish of the trip. We couldn’t rate the day enough and were so glad that we decided to rent the boat with a skipper. You can also just rent the boat if you have good experience with driving them (we wouldn’t know where to start!). The other excursion I did on my own with a tour group, called The Myths and Rivers. This trip took us back in time and was split into two parts; a visit to the Nekromanteion and the Acheron River. The Nekromanteion is situated on top of a hill in the village named Mesopotamos. It is an interesting historic site to visit, with ruins to look around, however, you do need to imagine how it was in mythical times to get a true feel for the place. The guide was great at telling the various stories surrounding the site. There are also interactive videos to watch of how they have restored items found and some of the buildings. The next stop on the trip was to the Acheron River, situated near to the village of Gliki. Parts of the river can be accessed by boat (see above), however, these can only go so far up before it becomes unsafe to drive a boat. This part of the river is located in the village of Ammoudia. For this part of the trip, you had the option of walking up the river with the guide for the chance to become immortal. According to Greek mythology, this is the river where Achilles was dunked into the river by his mother as a means of protection. However as she held onto his ankles so tight, this part of his body was not made immortal, and this is where the saying of ‘weak spot’ comes from, as Achilles was killed by an arrow to his heel. I digress… Walking up the river to become immortal seemed like fun until you stepped into the river. It was absolutely FREEZING!!! We were told, that there was a part of the river that we may need to swim, as the water levels rise and fall depending on rainfall, unluckily the water was high and we had to swim. By this point, I could not really feel my legs and couldn’t really get any colder so went for it. A few people decided to turn back at this point. The best part of the trip was when the guide gathered us around a small fresh water spring coming out of the high rock side of the river, he paired us up and on the count of three, we had to duck under the water. This part of the water was even colder! On the way up to the spring there was a man walking his dog in the river…now if a dog can handle the cold then so could I! There were other activities that could be done at the river, such as horseback riding and kayaking, however, I chose to just walk up the river. Along the river bank, there was a taverna where we could have lunch. Again the food was delicious. 1.Wear swim shoes as the riverbed has some boulders and can be very slippy and uncomfortable underfoot. 2. Make sure you have a waterproof camera, as the views of the river are amazing. High rock faces and crystal clear water. All in all this trip was fantastic, and a well needed week away! I had never thought about visiting the Greek mainland before this, as Greece is always advertised for its many islands, but this little town was a welcome and pleasant surprise. There is so much that can be done, but with a week trip, it is impossible to fit everything in. There are many excursion to further inland, as well as boat trips to neighbouring islands of Paxos, Antipaxos and Corfu. Parga also houses its own castle which overlooks the harbour and Valtos beach. Here you can have something to eat and drink, as well as explore the castle. We went here at night and I wish we had looked around during the day, but I will save that for the next trip. I really wanted to go on the tourist train, which takes you to the village of Anthousa to see Ali Pascha Castle, however, the train always looked busy and I never got around to booking it…again next time! I will definitely be visiting again, and hopefully for a longer stay! Thanks for reading, and I hope to see you in the next blogpost!